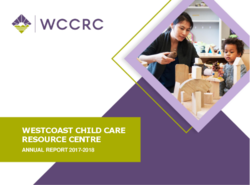 Westcoast Child Care Resource Centre provides information, referrals, training and resources to families, individuals and organizations who are seeking the best child care and early learning. A community that promotes, encourages, supports and expects excellence in early care and learning. We believe accessible, affordable, inclusive, quality early care and learning programs are at the heart of community and every family is entitled to access. We embrace the diversity of our communities, promote anti- bias goals and strive to meet the needs of the people and organizations we serve. We promote professionalism through advocacy, research, education and best practices and as a learning organization are dedicated to excellence, capacity building, flexibility and creative change. Answering important questions for more than 20,000 parents and caregivers each year. Referrals in several languages to over 5,000 parents each year. WCCRC provides consultation and guidance to government, researchers and other organizations to promote and support excellence in early care and learning in BC. Many different courses, workshops and seminars for professionals, parents and caregivers. Westcoast Early Learning Library (WELL) is a publicly accessible collection of more than 12,000 loanable early learning resources. Our collection includes books, periodicals, audio-visual materials, toys and kits. We also stock resources in different languages. Board members are elected at our annual general meetings (usually held in September) for a two year term. We are pleased to present our Board of Directors for 2018-2019. Interested In Becoming A WCCRC Board Member? If you share our goals and values and want to contribute your knowledge for the benefit of children and families and those who care for them, consider applying for a Director position on Westcoast’s Board of Directors. We need your commitment, your energy and your expertise. Complete the application form (.docx) and send it to Westcoast (Attention: Board Chairperson) by email (board@wstcoast.org), mail or fax, 604-709-5662. Download the Board Recruitment Brochure (PDF) for more info.